The beauty of San Francisco is best appreciated from its highest points. The city's 43 rolling hills offer spectacular scenery. Sandwiched in between the Pacific Ocean and San Francisco Bay, the city was built up between 1849 and the early 1900s, despite the challenging landscape. Many streets are so vertiginous that the sidewalks are actually pedestrian steps (used by locals instead of StairMaster). 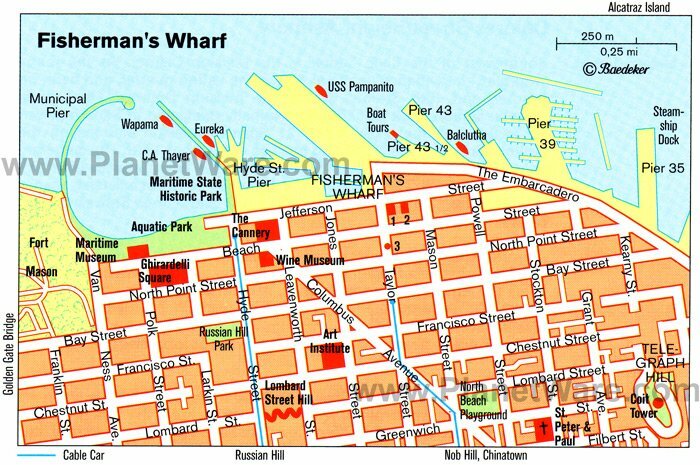 The dramatic topography also explains some of San Francisco's most iconic images. Lombard Street owes its famous curves to the road's sheer incline; its red-brick switchbacks make it safer to drive up and down. Cable cars were also designed to tackle the extreme gradients. This self-guided walking tour traverses San Francisco's steepest streets in quaint historic neighborhoods that are full of character. More of an urban hike, the tour is physically strenuous, but every step of the way is rewarded with gorgeous sights: pastel-painted Victorian houses clinging to dizzying hillsides; flowering staircase gardens tucked away on side streets; views of the majestic bridges, and sailboats gliding around the bay on a sunny day. Soak up the panoramas while visiting the highlights of San Francisco in about four to five hours. Begin the walking tour at the Dragon's Gate, at the intersection of Bush and Grant streets. Visitors can arrive at San Francisco's Chinatown from any of the bordering neighborhoods: Union Square shopping area at Bush Street, the ritzy residential streets of Nob Hill at Powell Street, Little Italy (North Beach) at Columbus Street, or the bustling financial district at Kearny Street. However, the Dragon Gate marks the official entrance. Built in 1970, the green-tile pagoda-topped gate features two small dragon statues at each side and presents Chinese script that translates to "Everything under heaven is for the good of all people." While rambling past the touristy souvenir shops on Grant Avenue, consider the turbulent history of this compact area, the most densely populated section of the city. Dating back to the Gold Rush era, this neighborhood is the oldest Chinatown in the United States and the largest Chinese community outside of Asia. During the 1800s, Chinese immigrants faced problems of discrimination and overcrowded housing. In 1882, the United States passed the Chinese Exclusion Act, which restricted immigration from China. This xenophobic law stayed in effect until 1942. Yet, the Chinese labor force built much of the city in the 19th century. Continue on Grant Avenue until Washington Street, make a left, and then right onto the narrow pedestrian street, Ross Alley. The small nondescript building #56 is the Golden Gate Fortune Cookie Factory, where tourists may stop in to watch fortune cookies being made as well as purchase cookies. This tiny factory has been producing delicious fortune cookies since 1962, and the cookies are still made by hand. Fortune cookies were actually invented in San Francisco and do not originate in China, although some historians believe that the inspiration came from 14th-century moon cakes. The round cakes concealed messages of Chinese soldiers used to coordinate a revolt against Mongolian invaders. In fact, the history of military messages hidden in baked goods goes back to ancient Greece at the time of Alexander the Great. Today's fortune cookies contain optimistic Confucius-like statements designed to delight diners after a meal. From Ross Alley, continue one block west and two blocks north to Stockton Street at Broadway, where the sights, sounds, and smells of Chinatown are unveiled. In between Broadway and Columbus Avenue, Stockton Street is lined with grocery shops and markets frequented by locals, many of whom only speak Chinese. Peek inside the stores (photographs are forbidden) to see the exotic Asian fruits and vegetables, fresh seafood, as well as live fish, turtles, and chickens. An easier way to experience authentic Chinese cuisine is by dining at one of Chinatown's best restaurants. Just off Stockton Street, the Michelin-designated Z & Y Restaurant (655 Jackson Street) has a world-renowned chef and serves outstanding Sichuan-style Chinese food. Counted among the restaurant's distinguished guests are the presidents and foreign ministers of the People's Republic of China as well as U.S. President, Barack Obama. From Stockton Street at Broadway, turn around and head south towards Jackson Street (turn left). Keep walking east on Jackson Street until reaching Montgomery Street to explore the historic Jackson Square area. This district also overlaps with the Barbary Coast Trail that marks Gold-Rush-era sites with bronze sidewalk medallions. Jackson Street boasts distinguished brick buildings from the 1850s and 1860s that survived the 1906 earthquake. Full of Old World charm, Jackson Street is lined with shady trees and quaint cast-iron street lamps. Many of the buildings house prestigious art galleries, fine antique shops, and interior design boutiques. The area also has several top-rated fine dining restaurants. Continue uphill on Montgomery Street to reach Telegraph Hill. At Montgomery and Broadway, turn around to admire the view of the Transamerica Building. The next several blocks feature a sheer incline with staircases along the sidewalk to help pedestrians brave the uphill climb. At Filbert Street, turn left onto Filbert Steps, a beautiful staircase with lush, quiet gardens on either side and lovely homes built into the hillside. Climb up the staircase of 80 steps and then take another flight of 30 steps that leads to the landing of Coit Tower. One of the city's most iconic sights, the tower stands on the former site of the telegraph station for which the neighborhood is named. Surrounding Coit Tower is the Pioneer Park recreation area, nearly five acres of wooded park space with sensational vistas of the city and the San Francisco Bay. As you wander along the park's trails, take in the gorgeous vistas and listen for the sounds of exotic birds. The legendary flock of parrots, featured in the Wild Parrots of Telegraph Hill film, make their home on these forested slopes. Perched on top of Telegraph Hill, Coit Tower is a beacon in the San Francisco skyline. This famous landmark is visible to visitors when taking the ferry from the East Bay or driving across the Bay Bridge as well as from other points in the city. Built in 1929, the tower was funded by and named after Lillie Hitchcock Coit, a wealthy socialite and patron of San Francisco firefighters. Although it's said that the tower's fluted shape resembles the nozzle of a firefighter's hose, the architect, Arthur Brown Jr., who designed it did not intend this effect. The openings at the top that appear to be the nozzle's spout are actually windows. Take the elevator up to Coit Tower's Observation Deck (admission price) to admire sweeping views of the Bay and downtown San Francisco. The Observation Deck provides 360-degree panoramas, and the vantage points from each window offer a different outlook, such as the Bay Bridge, the Transamerica Building, and the picturesque hills of North Beach. Before or after visiting the Observation Deck, spend some time viewing the murals inside the tower's base. The series of Depression-era murals were painted in 1934 in a thematic style that recalls the work of celebrated artist Diego Rivera. At the time that the murals were painted, the content was considered to be radical because it depicts laborers and farm workers as the central subject. The block of Columbus Avenue between Pacific Avenue and Broadway was the stomping grounds of Beat poets during the 1950s. This area once buzzed with counter-culture energy and attracted the beatnik literati. Jack Kerouac author of On the Road, one of the most celebrated works of the Beat generation, and Allen Ginsberg, who wrote the non-conformist rant Howl, once read their poetry at City Lights Bookstore. Beat poet Lawrence Ferlinghetti founded (and still owns) this legendary bookshop that continues to exude a distinctly bohemian attitude. After visiting City Lights, saunter down the adjacent Jack Kerouac Alley, a 60-foot-long cobbled pedestrian thoroughfare with vibrant murals and old-fashioned street lamps. Chinatown begins at the Grant Avenue end of the alley, while the Columbus Avenue end is in the heart of North Beach's historic beatnik neighborhood. Fitting of its location, the alley features sidewalk medallions inscribed with literary quotes by great writers, such as Jack Kerouac, John Steinbeck, and Maya Angelou. To learn more about Beatnik culture, take a short detour to visit the Beat Museum at 540 Broadway. The museum is dedicated to sharing the idealism of the Beat Generation. Defined by its individualistic spirit, this artistic movement of the 1950s included a collection of poets, writers, thinkers, and artists who were devoted to creativity, tolerance, courage, and compassion. The Beat Museum displays an extensive collection of memorabilia from Beat authors, including letters, photos, original manuscripts, and valuable first editions. San Francisco's colorful Little Italy dates to the late 1800s. Charming residential homes line this historic neighborhood's steep streets, intersected by the more modern and busy thoroughfares of Columbus Avenue and Broadway. A beach used to border the neighborhood, but the area was developed with landfill, although the name stuck. North Beach is full of old-school Italian restaurants, with red-checkered tablecloths, that serve enormous servings of pasta, and atmospheric cafés where patrons go to see and be seen and sip on authentic Italian espresso. It's also a great place to browse boutiques, pop into a gelato shop, or sample treats at an Italian bakery. Columbus Avenue has the highest concentration of restaurants and cafés, and tends to be very touristy, whereas Grant Avenue is a quieter street with restaurants and shops frequented by locals. Continue this walking tour at Columbus and Broadway, just north of Jack Kerouac Alley. Stop for a snack, coffee, or lunch at one of the bustling cafés. Favorites are Caffe Puccini (411 Columbus Avenue) and Caffe Greco (423 Columbus Avenue) as well as the legendary Caffe Trieste (601 Vallejo Street, a block from Columbus), a popular locals' hangout. After the café break, wander along Columbus (heading north) until reaching Washington Square Park. This pleasant, tree-shaded green space is at the heart of North Beach. It's a peaceful spot that is wonderful for sunbathing and picnics or playing volleyball and frisbee. Overlooking the park is the impressive Saints Peter and Paul Church with its Gothic spires serving as a focal point in North Beach. The graceful edifice of this Roman Catholic Church was completed in 1924. Beside its architectural beauty, the church is the location where Marilyn Monroe and Joe DiMaggio took their wedding photos. Today, the church reflects the neighborhood's multicultural character; mass is offered in English, Italian, and Chinese. Continue back on Columbus Avenue until Vallejo, turn right and head up into Russian Hill. In the 19th century, the graves of Russian soldiers were located on the hill that is now Vallejo Street, giving the neighborhood its name. As you climb Vallejo Street, you will come across two staircases surrounded by gardens with amazing views. After crossing Mason Street, the next block of Vallejo surprises visitors with a tiny but delightful green space - the Ina Coolbrith Park. Stop to smell the roses, then keep going up one more block on Vallejo and turn right on Jones Street. From the intersection of Jones and Green streets, take in the incredible panorama of the Bay, with Alcatraz in the foreground. Turn left on Green Street, then right on Hyde Street. Stroll three blocks north on Hyde through an elegant residential neighborhood, until reaching Lombard Street. Arrive at one of the most popular tourist attractions in San Francisco, the city's famous curvy road. From the top of this winding road at Hyde and Lombard is a sensational viewpoint looking back at Coit Tower. The only part of Lombard that appeals to tourists is found between Hyde and Jones Streets. Known as the Crookedest Street in the World, this portion of Lombard boasts a steep 27-degree angle. The road was paved with switchbacks in the 1920s to make it safer for cars to drive up and down. The street also has pedestrian staircases on both sides, ideal for a leisurely ramble with the other groups of tourists you'll likely see here. Flanking the brick-paved winding curves are beautiful homes in Edwardian, faux Tudor, and contemporary architectural styles. Lush geranium-filled flower beds blossom in between the switchbacks, giving the street the look of a garden. From Lombard Street, hop onto a cable car at Hyde Street and enjoy a scenic ride down to Fisherman's Wharf. A downhill walk or cable car ride from Hyde at Lombard leads to Fisherman's Wharf. This nostalgic waterfront neighborhood delights visitors with refreshing ocean breezes and stunning seaside scenery, while tempting foodies with fresh sourdough bread, fish & chips, clam chowder, and locally caught crab. In the 1800s, the area was a hub for recently immigrated Italian fishermen. Although Fisherman's Wharf still has many commercial fisheries, it's now a major tourist destination packed with souvenir shops. So it would be easy to overlook the small picturesque wharf at Jefferson Street between Leavenworth and Jones, which was part of the historic fishing village that predates the Gold Rush of 1949. The little boats docked at the wharf are traditional Italian fishing boats called feluccas. Notice that the hulls are painted with the names of Catholic patron saints. Try to picture the fishermen venturing out into the mist-shrouded bay on these tiny boats. The fishermen were known to sing Italian opera songs while sailing around in the fog. After talking a stroll along the wharf, stop to sample the sourdough bread at Boudin Bakery, get a bite to eat at a fish shack, or try the fresh cracked crab sold from sidewalk stands on Jefferson Street when it's in season.